Please come back each week to find out all about what we've been getting up to. Also scroll down to the bottom for class newsletters, other letters and photographs. 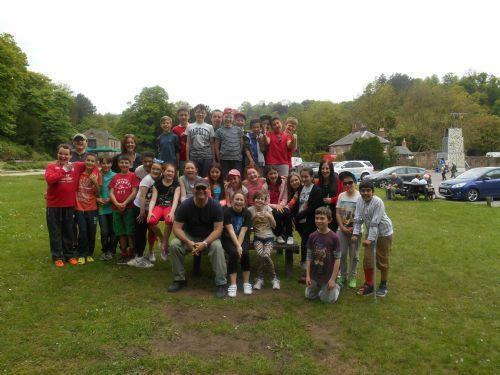 On Tuesday 15th Year 6 went to Wheelgate Park to celebrate the end of their time at primary school. We had a fantastic day even though the weather wasn't brilliant! Scroll down to the bottom to see photographs. This week was great fun! The performances you put on of our end of term production 'Robin Hood' for your parents, family and the rest of the school were absolutely amazing! You were all wonderful in your roles and sang beautifully. Scroll down to the bottom to see photographs of the production. In Art this week we looked at WW1 pictures and created our own WW1 silhouettes using charcoal and black paper. They are on display in the hall. Also this week we have continued to read our class novel 'Kensuke's Kingdom' and wrote playscripts of Mum and Dad's reaction to Michael going missing. A busy week - have a lovely weekend. This week all of you going to Saint John had a super 2 days transition at your new secondary school. You have all come back very excited about the time you spent there. We have spent some time reheasing for our end of term production - don't forget to learn your lines and song words at home. We have not got much time in school to practise. Next week we have got sport's day on Wednesday morning. On Friday we are going to spend the morning at Saint John in the ICT suite. We will desgn cars on the computer and then race them around 'Silverstone Race Track'. We took a class vote on where you'd like to gon on your leaver's trip - the most popular place voted for was Wheelgate! Don't forget school is closed on Monday for an INSET day. We've had another great week in year 6 - we started reheasing for our end of term production of Robin Hood! Please practise your lines and song words - we have not got long before we are performing to the school! On Tuesday afternoon lots of Year 6 children went to represent our school at district sports. You all did very well and overall our school came 3rd. Don't forget next week you have got a 2 day transition at Saint John. 'Good Work Award' - went to Callum for a beautifully presented and well written argument about children being given homework. 'Courtesy Award' - went to Jasmine for being so well mannered, helpful and smiley in class and around school. 'Star Writer's Award' - went to Jess, Eoin and Elisa - for brilliant discussion texts about homework. 'Sportsperson' - went to Ciaron. 'Marvellous Mathsmatician' - went to James for being able to use the Maths Table in MMS to add, subtract, multiply and divide fractions. 'Headteacher's Courtesy' - went to Sofia for being so well mannered to Mrs Clarke, whilst feeling very under the weather!! Happy Birthday to: Callum for the 18th June and Cole 22nd June. Thank you to all of you who helped out at the summer fair last Saturday - we really appreciate your help in raising money for the school. This week we started our WW1 topic - you had some great enquiry questions - it should be a very interesting topic. We also had a lovely trip out on Tuesday morning to Frankie and Benny's in town. You all behaved superbly - we even had an e-mail from a couple who were passengers on the bus, to say what a credit you are to our school - well done. The pizzas were delicious and it was a fun morning out! On Thursday afternoon Saint John Houghton teachers came into teach you for the afternoon - I know you all really enjoyed the activties. Also, today a tennis coach came into work with Year 6 - he will be coming in to train you over the next 4 weeks (see photographs below). 'Good Work' - went to Ciaron - for his WW1 enquiry questions - it should be an interesting topic. 'Courtesy Award' - went to Emily - for always being so well mannered and helpful in the classroom. 'Lunch time Award' - went to Thomas - he'll be able to invite someone to golden table next week. 'Star writer' - went to Sofia - for a well structured discussion text. Today we led a lovely Mass at Church to celebrate Father Berry's 60th anniversary of Ordination into priesthood. This week we started our topic on arguments and disucssion texts. Unfortunately Sports Day was postponed due to the bad weather. There was no celebration assembly this week. We have been very busy getting games and stalls ready for the summer fair tomorrow. You all had a lovely weekend at the Briars last weekend and made the most of your time there. Scroll down to the bottom of the page to see photographs. 'Courtesy Award' went to Conner - well done - all members of staff commented on what a lovely, well mannered young man you were at the Briars last weekend. 'Good Work Award' - went to Alfie for his super writing and presentation of his Beauvale leaflet. 'Sportsperson of the week' - went to James. Year 6 got 'Tidy Tim' - for having a nice tidy classroom. Well done Year 6 - you've survived SATS week. You've all done really well and tried your very best. Now it's time for the fun to begin today - with a weekend at the Briars. Today was a really brilliant day - you all thoroughly enjoyed yourselves taking part in all of the activities on offer. We did: canoeing, a rock climbing wall, bush craft and team building games. Scroll down to the bottom of the page to see photographs of us today by Cromford Canal and over the weekend at the Briars. Happy Birthday to Jess - 13th. Well done to Amy for getting this week's lunchtime award. Well done Year 6 - you have all worked really hard this week and prepared really well for SATS next week. 'Courtesy Award' - Edwyn - a super member of year 6. He's always so well mannered and extremely helpful in class. 'Lunchtime Award' - went to Liv - she'll be able to invite someone to sit on the golden table with her next Wednesday. 'Headteacher's Courtesy Award' - also went to Liv - well done. For always being sensible and mature around school. 'Good Work Award' - went to Sami. A fantastic artist and for 100% effort in all lessons - a super role model to others! 'Headteacher's Good Work Award' - went to Jasmine for fantastic progress in her Numeracy work. Playleader awards were given to: Sami, Edwyn and Sebastian for all of their hard work and support to Miss Pike and KS1 at lunchtimes - well done. Happy Birthday to: Ben (6th May) and Alfie (8th May). Thank you to Alex, Ben and Sofia for representing our school this week at Mass at the Cathedral - this was to celebrate and thank Bishop Malcolm for all of his work in our diocese and to wish him well for the future. Welcome back to school - hope you've all had a super holiday and have come back to school ready to work hard. It is a very short half term, with only 5 weeks and 2 Bank Holidays! This week in Literacy, we started our topic on 'Formal and Impersonal Writing'. We are looking at different guides to tourist attractions - don't forget to pick up some leaflets if you visit anywhere interesting. In Maths we have been revising Handling Data. In RE we started our new topic on Witnesses. Please scroll down to the bottom for our class newsletter and RE newsletter. 'Headteacher's Courtesy Award' - went to Amy for always smiling and greeting him so cheerfully. 'Marvellous Mathematician' - went to Ally for working hard to get his highest mental maths test score today. 'Headteacher's Good Work Award' - went to Alex for good mental maths strategies. 'Good Work Award' - went to Izzy for getting 19/20 on today's mental maths test! WELL DONE TO TODAY'S AWARD WINNERS!! Don't forget Mass next week on Friday at 9.30am in Church. We've had another very busy final week of term. On Wednesday we wore blue as part of Autism Day and we looked at the United Nations Rights of the Child. On Thursday we watched the year 3/4 Easter production - which was amazing. This morning, we led our end of term Mass at Church on the theme 'The Cross'. Well done and thank you to all of you who took part. This afternoon we had lots of fun and finally got to erupt our Volcanoes (KS1 enjoyed watching). Scroll down to see photographs. Have a lovely Easter break - don't eat too many eggs and don't forget to complete your homework... There are some good websites for you to revise on - BBC revise wise etc. Thank you to all of the parents who attended our SRE and Briar's meeting on Monday. Information will be sent home with the children for parents who were unable to attend. 'Marvellous Mathematician'- Savannah - super work on fractions this week. 'Courtesy' - Jess P - we don't know what we'd do without you Jess. So helpful. Always offering to give up her free time to do jobs for us. A really lovely, polite young lady!! 'Good work' Conner - for a massive improvement with the presentation of his work. We've had a very busy week this week, with Science week and Sport's Relief day. Mad Science delivered a fun session on Monday afternoon - the 'Robot Wars' was thoroughly enjoyed by all - some inventive designs - well done to Ben, Joe and Jasmine for their winning robot design. Scroll down to the bottom of the page to see photographs. We also had a great sport's relief day today - we started off with a warm-up with the whole school on the KS2 playground. We had 10 fun activities to compete against each other in. Scroll down to the bottom of the page to see our photographs of our Sport's relief day. Louisa 'Courtesy Award' - for always being so polite and well mannered - very helpful in the classroom. Sofia 'Star Writer' for her Sport's Explanation in Big writing. Conner 'Good Work Award'- for good answers during Science week. Callum - Sportsperson of the week. Happy Birthday to Sofia for today 21st March and Freya for the 22nd March! Enjoy your celebrations girls!! Don't forget SRE and Briars meeting 5pm at school on Monday 24th. 'Good Work' - Cole and Jess D - for your super work together in ICT/Geography, creating a fact file on your chosen volcano. 'Marvellous Mathematician' - Freya - for a very high score in her mental maths test. 'Courtesy Award' - James - for his super manners and great behaviour in class and around school - a great role model to younger pupils. 'Star Writer' - Savannah - for a brilliant diary account for an imagined holiday, which went wrong! Next week is a very busy week - on Monday we start Science week and have a session with 'Mad Science'. On Wednesday it's INSET day. On Friday is 'Sport's Relief' - come dressed sporty!! Think carefully about what Father Berry said - what are you going to try to give up during Lent? What might you try to do (more of)? On Thursday we dressed up as our favourite book as part of World Book Day. Scroll down to the bottom of the page for photographs. 'Courtesy Award' - Joe - for being polite and courteous. Don't forget the photographer is in school next Wednesday for class photographs. We hope you have all had a fantastic week off and are ready for another busy half term! This week in Literacy we started a new topic on writing different types of letters, in Art we started to make the structures for our Volcanoes and in Science we learned about the functions of the different parts of a plant. 'Courtesy Award' - Izzy - for being such a huge help in the classroom - always willing to give up her free time to help out with jobs. Next week the Church season of Lent starts - Don't forget Ash Wednesday Mass at Church 9.30am next Wednesday. Also - don't forget to dress up as your favourite book character next Thursday. 'Good Work' - Cole - for deep thinking in RE about St. Paul's letter to the Roman's on his advice about how we should live. 'Courtesy Award' - went to Freya - a super member of our class who is always so very kind and caring. 'Star writer' - went to Emily -for some thoughtful personal reflections and trying hard to link her ideas to Scripture. 'Marvellous Mathematician' - Sebastian - well done for completing lots of extra work at home to improve levels you're achieving on practise tests. We've had another great hard working week - we all managed to get our final pizzas made - they all looked amazing but perhaps didn't all taste quite so good!! Scroll down to the bottom of the page to see some photographs. 'Courtesy Award'winner - Savannah - a fantaastic member of our class - always cheerful, friendly, polite and helpful!! 'Star writers' - Ben and James - well done for super posters promoting how to keep our hearts healthy. 'Good work' - Thomas - for thoughtful evaluations of his Science investigations. We've had a great day - non uniform day to raise money for the British Heart Foundation. We've had a great circuit training session - well done most of you managed to beat your own scores. 'Marvellous Mathematician' went to Joe for his understanding of how to calculate percentages. Alfie - working really hard all week and remebering how to convert fractions and decimals. 'Good Work Award' - also went to Alfie for fantastic contributions to class discussions. 'Courtesy Award' went to Amy - for being a super role model to others and for always having a big smile on her face. Lunch time awards went to Ryan and Conner - well done you can choose someone to sit on the golden table next Thursday. Don't forget non uniform next Friday - wear red - for the heart foundation. Parent's evening on Tuesday 4th and Wednesday 5th from 3.30-6.00. Finally - don't forget book fair after school each day next week - let me know if you can help out! Today we went to Church for the Service of Christian Unity and created a lovely display of the French Canadian Culture. In Science we looked at which solids dissolve into water. We investigated whether we could separate solids which have dissolved into water. In DT we looked at the 'Eatwell Plate' to discuss what constitutes a balanced diet. In geography we looked at where in the world active Volcanoes are located and why. 'Courtesy Award' went to Sami - for being so well mannered and such a great role model to his peers. 'Good Work' went to James for excellent participation in class - always got his head down working hard to complete tasks. 'Star Writer' went to Ryan - for a fabulous playscript to try and convince mum and dad to let him go out on his own with friends. 'Marvellous Mathematician' went to Jess P for great effort in class. 'Lunch time Award' also went to Jess so she'll be able to invite someone to come and sit with her on the golden table next Thursday lunch time. Happy Birthday to Edwyn for today!! We've had yet another busy week in Year 6. In Science we looked at how to separate solids from pond water, using sieving and filtering. In Geography we talked about how millions of years ago there used to be a 'super Continent' and how there are plates underneath the Earth's crust, which move around slowly. In Literacy we started to write our own Quest Stories with multi-pathways. In DT Mrs Brough showed you how to make a basic pizza base - the pizzas were delicious! In ICT we started our new topic on Spreadsheets - to build on the skills you developed in Year 5. Maths award - this week went to Emily who always has her head down working really hard in Numeracy and is developing a much faster recall of times tables - well done. 'Good Work' went to Sebastian for his enthusiam in all topic work, especially Geography this week. 'Courtesy Award' went to Eoin, who always greets me with a super smile every morning and is always so polite and well mannered to everyone! A fantastic role model. 'Star Writer' went to Freya for writing a fantastic chapter 2 for her group's quest story. Don't forget we are going to Church next Friday for the service of Christian Unity. We hope you've all had a really lovely Christmas with your families and are all ready for the new half term. Please scroll down to the bottom to find a copy of this half term's class newsletter. This week we started our new topics. In Geography you thought of some fantastic enquiry questions to begin our topic on Volcanoes and we looked at the internal structure of the Earth. In DT, everyone really enjoyed taste testing various types of pizza in preparation for designing and making your own. In Literacy we have started to look at Quest stories, with multi-pathways. It should be a fun half term! 'Marvellous Mathematician' - Well done to Olivia for achieving 16/20 on your mental maths test! 'Courtesy Award' - Jessica D for her super attitude in class and being a great role model to her peers! 'Good Work Award' - Sami for completing his pizza survey so thoughtfully. 'Headteacher's Good Work' - Eoin - for applying his mathematical knowledge and understanding so well in test questions. 'Lunchtime Award' - went to Edwyn - well done. Don't forget your homework on French Canadian Culture - for next Wednesday. Father Berry wants us to create a display for Church ready for the Service of Christian Unity. We have enjoyed a very busy week. On Monday we visited the elderly at Edward's House and the residents thoroughly enjoyed your carol singing. On Tuesday we had a fantastic Christmas Party with Year 5, ate lots of food and played lots of fun games - very competitive year 6. On Wednesday we really enjoyed eating Christmas dinner with our friends - scroll down to the bottom to see photographs. On Thursday we had non-uniform day and a DVD treat (as we raised the most money for CAFOD). This morning, we celebrated a lovely Christmas Mass in Church with Father Berry to end our term. Well done to all of you who read so well. We also had a lovely Advent Service this afternoon, as well as our usual Sing For Santa - well done everyone. Wishing you all a very happy Christmas - have a great holidayand enjoy the rest. Well done today Year 6 - you all worked really hard to run stalls and games at todays Christmas fair - I'm sure you have helped the PTA to raise lots of money. We have got a really busy fun filled week planned for next week. Monday 16th December - we are going Carol Singing at Edward House. Thursday 19th December - Y6 Non-uniform day and cinema afternoon (for raising the most money for CAFOD). Don't forget your pop corn!!! Friday 20th December - Mass in the morning and Sing for Santa in the afternoon. Today we've enjoyed a really nice Christmas activity day and had lots of fun making cards, tree decorations, hats, bunting and stained glass windows. Thanks to everyone for bringing in so much chocolate for non-uniform day on Wednesday - we have got lots of prizes for next week's Christmas Fair. 'Marvellous Mathematician' went to Conner for showing good understanding of how to move the decimal point in division. 'Good Work Award' went to Jasmine for her super Christmas poster advertising our Christmas fair next week - it was very professional and must have taken her hours at home. Well done! 'Courtesy Award' went to Ciaron for being a super role model to his peers and younger children. And for his lovely sense of humour. Everyone has produced some lovely writing this week for display but 'Star Writer' went to Callum and Elisa for super newspaper reports about the break in at the three bear's cottage. Well done to the whole of Walsingham Class - we managed to raise the most money for CAFOD in our penny race - we can choose a class treat to share together - have a think and we'll have a vote next week! Thank you to all of you who came and supported us on Tuesday night at the Christmas Lights Switch on. The Lantern parade was lovely and the fireworks were spectacular!! Congratulations to you all for a super 'DARE' graduation on Wednesday. You all larnt your lines and your role plays really quickly and did a super, confident assembly to everyone. Well done. Thank you to Sophia and Ben for giving up your Saturday morning last weekend to attend Mass at the Cathedral, to celebrate the end of the year of Faith. 'Courtesy Award' - went to Cole, Christopher and Ryan for being kind and helpful to me. Thank you Boys!! 'Good Work Award' went to Ben for his truly amazing reading journal, in which he has completed lots of different tasks about what he has been reading. Well done! 'Marvellous Mathematician' - went to Callum for having a very good understanding of probability. WELL DONE EVERYONE FOR A GREAT WEEK - enjoy your weekend. This week we had a fab day on Tuesday 19th, working with Sarah, who is an artist. She came into school to help us design and make our STAR lanterns for the lantern parade. Thank you for your super behaviour as usual - she said our class were an absolute pleasure to work with - so WELL DONE!! (Scroll down to the bottom of the page for photographs). It should be a real fun night next Tuesday 26th when we take part in the lantern parade and the Christmas Lights are switched in Eastwood. Don't forget we need to meet at 7.15pm outside Eastwood library. Also don't forget RE homework for Monday morning!! Thankyou to Sophia and Ben for attending Mass tomorrow at the Cathedral in Nottingham. Mass is being celebrated by Bishop Malcolm to celebrate the end of our year of faith - thanks for representing our school. 'Good Work' - went to Jess P for 100% effort in every piece of work she completes. 'Courtesy Award' - went to Christopher for super manners in class and for always being so considerate and caring towards others. 'Marvellous Mathematician' - went to Ben for his super understanding of how to use the basic product to divide decimal numbers by whole and decimal numbers. 'Star Writer' went to Jasmine and Savannah for really thoughtful pieces of RE work about what their vocation in life is. Happy Birthday to Alex for the 21st November - enjoy your party!! Thank you to all of the parents who came into school this week to watch us at work in the classrooms - we enjoyed having you. 'Good work' - went to Olivia for her 'Mitzvah day' poster she designed in our RE topic on Judaism. 'Courtesy Award' went to Thomas - for super manners in class. 'Marvellous Mathematician' - went to Izzy for trying really hard in the mental maths test. On Monday we had a fantastic trip to the cinema to see 'The Odd Life of Timothy Green' - it was a fantastic and very emotional film (it had some of the children and adults in tears!!) The children were very well behaved and had a super time as part of National Film week. Today was non-uniform - thanks for your donations towards the Church fair tomorrow - hope to see you all there 10am - 1pm. Don't forget to sign up to come into school for our open days next week, to watch your children in action in the classroom! Cole 'Marvellous Mathematician' - well done for always putting your hand up to answer question and not be afraid to be wrong. Eoin 'Star Writer' for your spooky setting description using powerful adjectives and prepositions. Alfie 'Courtesy Award' - super manners, very respectful and always has a smile for us. Edwyn 'Good Work' for 100% effort in every area of the curriculum - always got his hand up to answer questions. Please invite your mum, dad and grandparents to our class Mass next Tuesday 11th November. We have had a lovely week back at school after our half-term holiday. We have got an extremely busy half-term planned, packed full of exciting things to do and take part in (see class newsletter - scroll down below). This morning we celebrated Mass together at Church for 'All Saints' - a Holy Day of obligation. Afterwards we stayed behind to interview Father Berry to find out all about his Vocation as a priest (our RE topic). Elisa 'Courtesy Award' - for being a super role model to her peers and taking good care of the younger pupils. Freya 'Good Work' - for continually making a massive effort to learn her times tables - scores going up each week - well done! James McElwee - 'Marvellous Mathematician' - for excellent understanding, presentation and working out in division and multiplication. Don't forget to bring your sweets for our trip to the cinema on Monday morning! Well done to everyone for a fantastic half term of hard work. In particular well done to Alex who achieved the most house points this half term, Jess P who came 2nd and Ben who came 3rd. Well done to this week's award winners!! 'Star Writer' went to Joseph for his writing in history about what the Celts were like when the Romans invaded Britain - well done. 'Courtesy Award' went to Ally - for his super manners. He always treats everybody with respect and kindness - a good role model to others! 'Good Work Award' went to Jasmine Warder for her fantastic RE homework about Mahatma Gandhi - who showed unconditional love throughout their life. Well done a super biographical account and explanation! 'Marvellous Mathematician' went to Sami for his brilliant understanding of the MMS method for division of HTU by TU - super presentation! Happy Birthday to James for the 9th October. Congratulations to this week's award winners! 'Star Writer' goes to Alex for his super RE work completed on 'The Prodigal Son' parable - Mr Ward was very impressed with the work you produced! 'Courtesy Award' went to Sebastian - for being such a kind hearted and helpful member of year 6 and a good friend to all! 'Marvelous Mathematician Award' went to Louisa for making a massive effort to learn her timestables! You are doing very well!! And Ciaron for super understanding of the grid method for multiplication which he did at home. 'Good Work Award' went to Ryan for a big improvement in his handwriting and the presentation of his work. Have a great weekend and don't forget to complete your RE homework - to research a person who has shown unconditional love to others throughout their lives! You need it for Monday's lesson. Keep practising those times tables!!!! Well done to Callum for being chosen to sit on the 'Golden Table' next Wednesday. Happy birthday to Emily for the 2nd October. Well done to all of you for another hard working week. Sofia - 'Courtesy Award' for being such a helpful and polite member of Year 6. Callum - 'Good Work Award' - for his intelligent and insightful discussion of the parable 'The Prodigal Son' and how the message is portrayed by different artists. Emily - 'Star Writer' for her exciting diary entry in Big Writing of an awful day out, where everything went wrong. Super imagination! Amy - 'Maths Award' - for being able to find the mean, median, mode and range of different sets of numbers - beautifully presented as always. Well done to those of you who completed level 1 and 2 bikeability yesterday. You all had lots of fun, whilst learning how to keep safe on the roads - Izzy, Alex, Conner and Alfie! Happy birthday to Ryan (for today)! This week we have started our new Literacy topic on 'Biographies' - don't forget to start reading one - go to the library or find one on the BBC website for kids. Eoin got the 'Maths' award for his brillisnt use of the grid method to multiply HTUXTU. Savannah received 'Good Work' award for good speaking and listening skills in Literacy. Alex received 'Courtesy award' for being a super role model to his peers and the younger pupils in school and always such a pleasure to have in the classroom. Don't forget to bring in photographs of yourselves and your families doing an activity/hobby you all enjoy together - we will use these to create our mosaics. Well done to all of you for such a wonderful Mass this morning - you read beautifully and behaved impecably! Happy birthday to Jessica (today) and Elisa (tomorrow) - enjoy your celebrations girls! We've had another super week of hard work in Year 6. In Literacy you've written some excellent reports about yourselves for display and your self portraits are fantastic! DARE started this week - which I know you'll all enjoy. Jess D is this week's star writer for her very informative report 'All About Me'. Emily recieved 'good work' award for her RE work - an endless list of all the things which are done for her by the people who love her! Sofia received our Maths award - she can find the 'mean' average of sets of values. Ben received 'Courtesy' award for being very helpful, for his super manners and excellent behaviour. Well done for all your efforts this week. Try to start reading a biography this weekend ready for our new Literacy topic. Remember to bring in some fruit and vegetables for Friday's harvest Mass. Thank you! Well done to all of you for settling in so well to Year 6 over the past 3 days. We had a fantastic Mass yesterday, celebrated by Bishop Malcolm, Father Berry and Deacon Steve to celebrate 50 years at the Priory School, in the glorious sunshine. Well done for your super tours of the school - we are very proud of you! Over the weekend don' forget to find out what you were like as a baby, so that you can write all about yourself next week! Start practising those times tables for tests next week!! Happy birthday to Eoin for the 1st September! Year 6 BBC Science Clips To help with SATS revision!